Thank you, Liz Jansen, for joining me on today’s post. 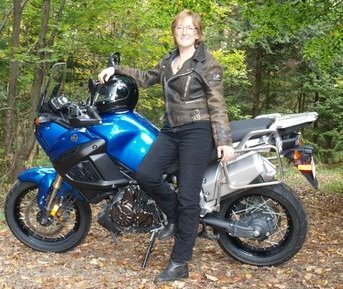 Her new book Women, Motorcycles and the Road to Empowerment: Fifty Inspirational Stories of Adventure and Self-Discovery, is a wonderful collection of interviews that Liz conducted with a wide range of women. Their interviews add a collective vision and colorful background to Liz’s own story, not only about motorcycling – but also about living. Together, the women’s voices emphasize how we are each unique and must follow our own dreams – no matter how crazy they seem to others. As artist, dancer and motorcyclist Lesley Gering proclaimed in the book, “This is who I be.” Exactly! You can buy her book via this link here via amazon or on her website, which also has details on the rest of her book tour. I’ve been enjoying the stops at various websites and blogs. Also, you can win a free (FREE!) book! Just post a pertinent comment on this blog post between now and Thursday, May 31, 2012 Noon EST, and Liz will draw a winner randomly. You can post a comment in response to Liz’s interview or answer: What do you do each day to help live your own best chapter? Diana: Liz, I love your book’s message. You described your journey and how you grew up in a Mennonite community. You were searching for your own path. You mentioned “that small inner voice” which was crying to get your attention. Any suggestions on how to find the inspiration to listen to that voice within? Liz: Our connection to the Universe, God, Spirit, whatever, whoever you want to call it, is our source of power. It’s not something anyone else can give us, nor can they take it away. That voice is our own spirit, wanting to be heard. It’s important to create a nurturing atmosphere for yourself. That includes setting aside time regularly in whichever way works best for you, to free yourself from all the other voices around you and listen to YOUR voice. It could be meditating, walking, spending time in nature or riding a motorcycle. It also means surrounding yourself with positive role models, people who support you on your journey. Start small, learning to trust that voice. Follow through and see what happens and how it feels. Not only will you find “coincidences” and synchronicities occurring with increasing frequency, but each success builds confidence and inspires you further. Diana: I like the story of Hazel Carson who bought herself a Honda Gold Wing motorcycle for her 60th birthday. She said that one of her friends commented, “If Hazel can learn to ride a motorcycle, then I can learn to play trombone.” (That’s like my post, “Anything worth doing is worth doing badly.”) What message does motorcycling give to people about empowering themselves to do what they don’t think they can do? Liz: Motorcycling, more than anything I know, represents all the challenges we put up in front of ourselves as perceived barriers. Women have to assert themselves in a male-dominated sport. Learning as adults is challenging because they’ve been told they couldn’t do it because they’re too old, not strong enough, not tall enough or smart enough. There are stereotypes to overcome, safety concerns , opinions of others, fear of failure or success. Motorcycling teaches you that anything is doable if you really want to do it. The barriers we put up in our minds usually have nothing to do with reality. Diana: In your book, Catherine Swift said, “I believe you make your own weather. If you are optimistic, it’s a lot more likely that good things will happen.” Have you been able to “make your own weather”? What do you do each day to help live your own best chapter? Liz: I agree with Catherine that we do make our own weather. While we can’t control when a storm decides to blow in, we can control how we respond. I do have a focus, but mostly, I live each day for all it’s worth. I try to stay in present moment and follow my intuition. I look at the past for the lessons it’s given me. Worrying about the future and outcomes which may never happen serves no purpose and diverts energy from what I’m supposed to be doing. All kinds of doors open which I would never have dreamt possible. I’m only able to recognize them by staying receptive and flexible. And mostly by following my intuition, aka that little voice we talked about earlier. Diana: In your book, Hollywood stunt woman, Debbie Evans Leavitt, said, “I’ve learned through motorcycling not to look at the problem but to look at the goal.” Could you tell us how you use that philosophy in your own life? Liz: My 2003 motorcycle odyssey is a good example of that. I had never travelled solo, let alone by motorcycle. I was 49 years old, had just left my marriage and a successful career. If I would have focused on those things, or how I was going to manage a big trip around Canada and the US, it would have been overwhelming. Instead, I took one day at a time. I knew I could ride a motorcycle and look after myself. I had a loose plan and prepared myself as best I could. It was no different than going for a ride every day. Next thing I knew, I was at the Pacific Ocean. Writing this book was another example. I had no idea what I was getting into other than I knew it was a calling to write it. So I started out and here we are. It’s been, and continues to be, an absolutely amazing experience, introducing me wonderful experiences and inspiring people. That’s not to say there aren’t challenges along the way. But getting beyond them is all part of the adventure and our personal growth. Diana: As you wrote, you grew up in a Mennonite community. What do you do now to nurture your own spiritual connection and feel a personal sense of transformation? Liz: While universal values were instilled in me through my upbringing, it was not at all where I learned about or began to understand my spiritual connection. In fact, that community built up walls which separated me from it. I had to remove myself from that setting to discover my spirituality. I start every day by meditating and journaling. It’s how I get my strength, stay grounded and connected. Transformation is an ongoing journey that continues as long as we’re here on earth. Post a comment in response to Liz or what you do to make this your best chapter to win a free e-book! This entry was posted in Being a Hero In Your Life, Transformation and tagged Catherine Swift, Debbie Evans Leavitt, empowerment, Hollywood stunt woman, Honda Gold Wing, inner voice, Liz Jansen, motorcycling, transformation, women and motorcycling. Bookmark the permalink. 10 Responses to Liz Jansen: Transformation is an ongoing journey that continues as long as we’re here on earth. I love how Liz describes setting up time for oneself to find one’s voice. Her book does not fall into regular inspirational but a maverick’s guide for inspiration. Thank you! I like the term maverick. We all have a little maverick in us! Hello Anonymous! You were the winner of Liz Jansen’s ebook! Do you want to make up a name and claim your prize? I need your email address (not for public use) so please get back to me ASAP. Thanks! Along the line of finding your voice, I find just making time to refresh and rejuvenate gives the voice some strength and clarity. Then, it’s easier to hear yourself think and truly speak your heart. And maybe that happens on the back of a motorcycle…. Thanks Liz for framing motorcycle riding in this way. Wise words Kelly. Thanks for sharing them. I agree – There are so many other voices out there trying to get our attention that we need to make a conscious effort to be quiet so we can hear our own. That can happen where ever works best for us. A walk in the woods, meditating, riding a motorcycle – front or back – it doesn’t matter. Thanks Sharon. Although many people have used the term “courage”, I never saw it as that. It would have been much harder on my spirit to stay in a situation that was draining my life energy. One of the fun parts about starting an adventure is you don’t know what you don’t know. Had I foreseen some of the things that were in store I may have been daunted. But I didn’t and looking back, I wouldn’t change a second. it’s been – and continues to be – an amazing journey. And each new chapter becomes the Best Chapter!